Monday 30 April. Trip to Granada. Weather today was sunny most of the time but with more cloud later in the day. Temperatures were up to 20C. 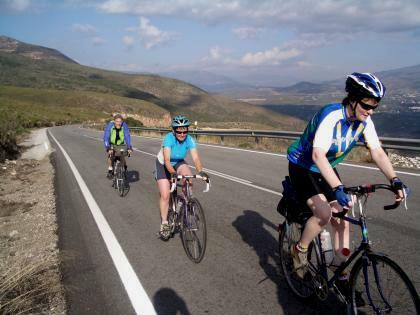 Last Tuesday when the rest of the group visited the Alhambra Palace in Granada Ernie, Phil and I rode up the Pico Veleta mountain road and Nicola went horseriding. Today Ernie Nicola and I went to Granada with the aim of visiting the Alhambra. The others had to queue for 2 hours so we had an earlier start and Ann dropped us off there at 7.30. Unfortunately the next day was the Mayday holiday and it appeared a lot of people had taken the Monday off as well. After queuing for 2 1/2 hours and making very slow progress I roughly counted the people ahead of us at 600 and probably at least another 1 1/2 hours of waiting so we gave up. 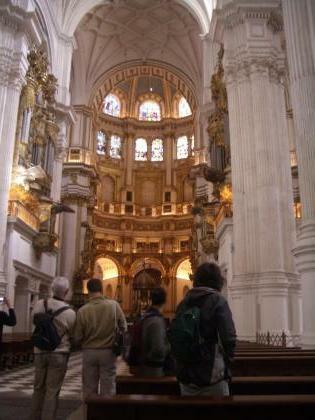 We walked down into Granada and after coffee in the square had a look round the impressive Cathedral. We had rung Ann and arranged an earlier pickup and returned to base. Saturday 28 April. Rest day and Walks. Weather today was again warm and sunny all day with temperatures reaching 24C. Today was a rest from cycling with 2 walks scheduled. Phil, Mary, Richard and Eileen went on a longer walk up a gorge and higher into the mountains. The rest of us went on a shorter walk in the local area guided by our host Anne. We took in old Moorish irrigation channels and the modern ones and stopped for coffee at the house of Mike a friend of Ann's. 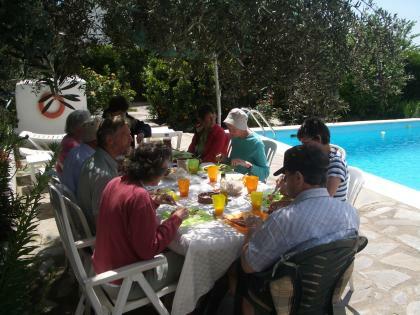 We had lunch laid on beside the pool back at base followed by some relaxation by the poolside. In the evening we went down to town for a meal and flamenco night. Phil awarded some prizes including Ironman or lady of the tour which went to Ann Kelly for riding all the hard rides and numerous lengths of the cold pool. Awards for infectious enthusiasm went to Avryl and Mike. Today the alternative options were a car ride and sightseeing on the coast at Almunecar or a long ride with numerous climbs to Castell de Ferro on the coast and back again. Ian again provided vehicle backup enabling riders to do just part of the route. Weather was again very good and mainly sunny except for some cloud building up on the higher mountain ranges. Temperatures reached 26C near the coast. 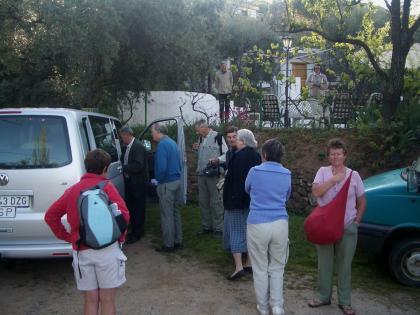 Mike, Alan, Liz, Elizabeth and Eileen were driven by our host Ann to the coast. Nicola went for a local walk. Phil, Mary, Jim, Ann, Gill, Ernie and Edwin set off on the long ride with an early 8.30 start. Richard and Avryl had a lift from Ian to do the middle part of the ride. 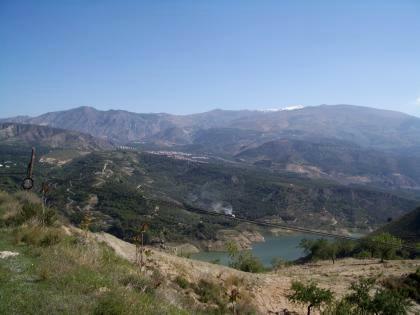 To simplify the geography there is a main massive of the Sierra Nevada range south of Granada. Ann's place where we were staying is on the southern foothills at about 2750ft. We descended from there to Lanjaron at 2100ft and then down into the valley to Orgiva Bridge at 1100ft. 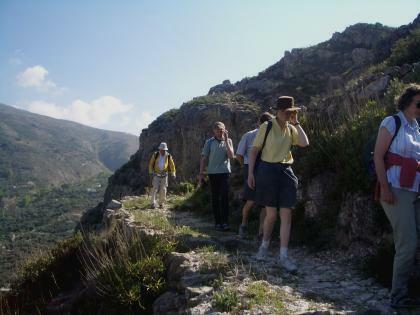 Then a long long climb up over one of the coastal mountain ranges called the Sierra de Lujar up to 3500ft and then a long descent to the sea. 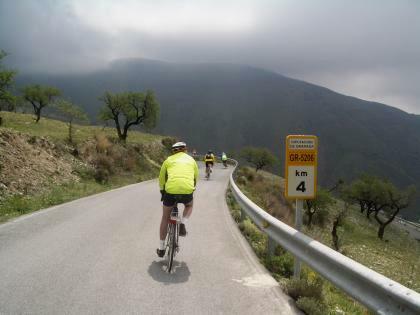 Towards the top of the Sierra de Lujar climb we rode up into the clouds and cycled through the mist to a bar near the top for elevenses. We were joined here by Richard and Avryl who were driven up with their bikes by Ian and after seeing the length of the climb they were very glad to avoid it. After elevenses there was a very long twisting descent down to the coast at Castell de Ferro where we enjoyed our packed lunches near the Prom. After lunch another long climb up over the Sierra del Carchuna. We stopped part way up at a bar for a drink and a break. Then on up to 16 big windturbines at the top followed by another twisting descent. Part way down the narrow descent we were held up briefly by a very long lorry with 2 enormous wind turbine blades as its load, trying to get round the sharp bends. Back down to the coast at Motril Ian guided us through the city stopping at various junctions. 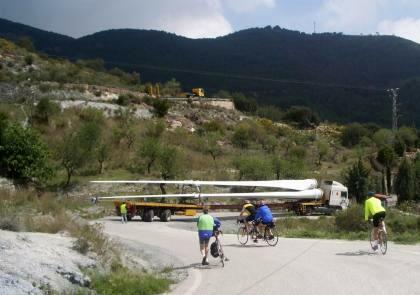 Then another climb through pineforest.Then down to Velez de Benaudaila and a stop for tea where our group of hungry cyclists demolished everything put in front of them. Richard and Avryl were car assisted from here. The rest of us continued with more climbing round Embaise de Rules lake and its dam and then down to Orgiva Bridge. 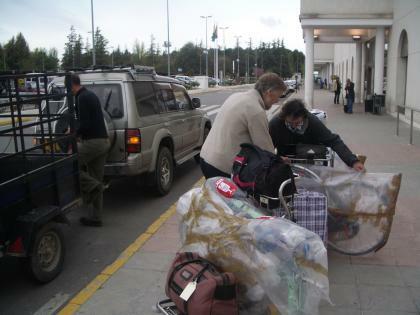 Here Gill and Ernie loaded their bikes on the car. Phil, Mary, Ann, Jim and myself remained. We rode up to Orgiva and with my back not doing any complaining I really wanted to do the whole ride. However a short way above Orgiva my chain snapped for the second time on the holiday. As we were running late I decided to take a lift back to base. My mileage for the day was 64 and for those doing the whole route it was about 68. In terms of feet of climbing in a day this was the second hardest ride I have ever done with 7752ft of climb. For those doing the entire route it was about 8500 ft of climb.